A one-day seminar for anyone interested in opening a bookstore. Students will receive a crash course on the essentials of opening a new bookstore or buying an existing one. 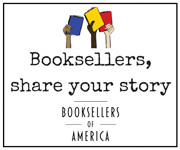 The workshop is open to ABA Provisional members and employees of Regular member stores, and is limited to three booksellers per ABA member company. Admission to Winter Institute is optional but guaranteed; separate Wi14 fee applies. The workshop will be facilitated by Donna Paz Kaufman and Mark Kaufman of Paz & Associates’ Bookstore Training Group (Fernandina Beach, Florida).